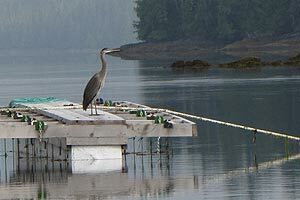 A heron sits on an oyster culture raft in Southeast Alaska. Why is Alaska a good place to grow oysters? Oysters can grow very well in cold water if there is abundant, high-quality plankton. Many estuaries in Alaska produce so much high-quality plankton during certain times of the year that Alaskan shellfish can match growth achieved by shellfish raised in warmer waters of the Pacific Northwest. Cold, clean water also reduces bacterial contamination, extending shelf life and assuring safety when eating cultured oysters, especially when eaten raw. Why are Alaskan oysters so remarkable? Pacific oysters, grown in warm waters, reach sexual maturation during their second summer of life, causing them to become soft and a milky color. These characteristics make the oysters unmarketable. In Alaska, because cold water retards maturation, high-quality oysters are available year round. Because they cannot reproduce, wild or naturally occurring, oysters are very uncommon in Alaska. All farmed Alaskan oysters are imported as spat (juvenile oysters) from Pacific Coast hatcheries. How do you raise shellfish? Generally, a shellfish farmer buys or collects juvenile shellfish, called "spat." He then puts them in special nets or lines (oysters and mussels) that are anchored in the ocean, or plants them on a beach (clams). The animals feed by filtering the abundant, high-quality plankton that naturally occur in the water. The farmer must keep the animals clean from algae and protect them from predators. He then harvests the animals when they grow to a marketable size. How long does it take the shellfish to grow to market size? What is a good farm site like? A potential farm site should have good tidal flushing so that food (plankton) is readily carried to the site and waste is carried out to sea. The site must be protected from storms. The site must be reasonably close to the markets that will buy the shellfish. Staff should be able to live near the site. Can I get rich from this? The industry is fairly new to Alaska and start-up costs are high. So far, most farms are providing some income, but generally not enough to support a family. Some of the challenges in Alaska are that farms are usually in remote areas and have high transportation costs. Shellfish farming is also hard work; to be successful, farms should be operated on a daily basis and worked year round. How long does the permitting process usually take? Are there any hatcheries or nurseries in Alaska? Yes. Refer to operations details for more details. Hatcheries spawn adult organisms (broodstock) and produce microscopic spat or seed. Nurseries can then grow these spat to a large enough size for shellfish farmers to place in culture gear or plant on their farm sites. What kind of shellfish/aquatic plants are being raised in Alaska? The shellfish farming industry in Alaska mainly produces Pacific oysters (Crassostrea gigas), blue mussels (Mytilus edulis), and littleneck clams (Leukoma staminea). Farms in Alaska are also raising Pacific geoduck (Panopea generosa) and scallops. No. Alaska statute 16.40.210 prohibits finfish farming. However, Alaska does allow nonprofit ocean ranching. Finfish farming is defined as growing or cultivating finfish in captivity. Ocean ranching, on the other hand, involves releasing young fish into public waters and being available for harvest by fishermen upon their return to Alaskan waters as adults. What about Paralytic Shellfish Poisoning? Paralytic Shellfish Poisoning (PSP) results from a specific type of plankton that filter feeders, like clams, oysters and mussels, sometimes ingest. This plankton can produce a toxin that is poisonous to humans. Each shellfish farm's product is closely monitored for PSP. All shellfish from a farm is lot tested using the Department of Environmental Conservation’s Uniform Shellfish Sampling Plan for Paralytic Shellfish Poisoning. If PSP is found, the grower cannot ship/sell his product. There has never been a case of Paralytic Shellfish Poisoning in Alaskan-farmed shellfish. What is required by the Department of Environmental Conservation? A growing area classification must be completed before shellfish may be harvested for sale. This may start anytime after the permits/leases have been obtained from the Department of Fish and Game and Natural Resources. Classification is a two-part process, the water quality survey and shoreline survey. The water quality survey consists of the collection of water samples that are taken from designated stations. The number of water samples can vary from 15 to 30 depending on the area classification. Fifteen samples are required for a remote area with no human habitation, whereas 30 samples are required for an approved area where human habitation is present. The shoreline sanitary survey is a physical onsite evaluation of all actual and potential sources of pollution that may affect the growing area. Water samples may be taken during the shoreline survey. Water samples can be taken by a trained individual or by ADEC personnel. ADEC personnel must perform all shoreline work. Both the water quality and shoreline survey results must be satisfactory in order for the area to be classified. For technical assistance, contact Gary Freitag, Marine Advisory Agent, in Ketchikan at (907) 617-8990 or by email at gary.freitag@alaska.edu. For business assistance, contact Quentin Fong, Seafood Marketing Specialist, in Kodiak at (907) 486-1516 or by email at quentin.fong@alaska.edu. To contact ADF&G Mariculture staff.